One of the most influential entomological conservation biologists and systematic taxonomists today. 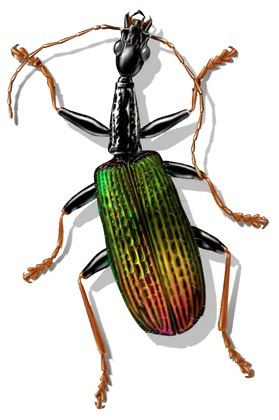 Terry is known by his closest peers for his expertise with the Carabidae - Neotropical ground beetles, especially those that never touch the ground. The tropical canopy-inhabiting genus Agra has become his personal burden, providing hundred of difficult species to describe, including such classics as Agra vation, Agra cadabra, and Agra katewinslettae -- names that give a hint at his sense of humor. 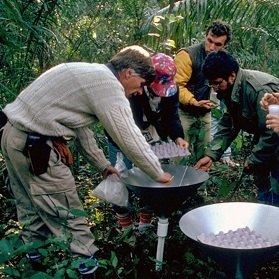 His 1982 publication on species richness in tropical forest canopies opened an entirely new area of research, and is one of the most cited papers in systematic entomology, biodiversity studies, conservation biology and the public press. His paper documented the vast amount of previously undiscovered life forms in tropical forests. It reenergized scientific inquiry into an inventory of Earth's biota. Terry's documentation of a huge and entirely unstudied fauna in the tropical rain forest canopy contributed greatly to the development of modern canopy studies - a large and productive area of scientific investigation that goes far beyond entomology. Terry also encouraged other scientists to develop and refine specimen-collecting techniques which resulted in huge new collections with which to study life on earth. These collections contribute fresh subjects for scientific laboratories around the globe. Terry is a curator of entomology at the Smithsonian's National Museum of Natural History. He has taken his passion for biodiversity conservation into environmental management, educational and public information areas. He has undertaken a major study of the impact of the oil industry on the forest health in the Ecuadorian Amazon, Terry is also a dedicated mentor for the next generation of scientists. He has served on the faculties at the University of Maryland, Auburn University, and at the University of Missouri at St. Louis. He mentors graduate students from around the world, often in universities in their home countries. Terry and his colleague, Scott Miller, are currently developing the Encyclopedia of Life Project at the Smithsonian Institution. Terry Erwin and his team collect insects.